ST. LOUIS–Any questions about Aaron Rodgers’ regular-season readiness were answered on the Packers’ opening drive of the game. Rodgers drove the Packers 86 yards in 12 plays. He was six of six for 47 yards and a touchdown in the drive, and the Packers led the Rams, 7-0, after one quarter of play at the Edward Jones Dome on Saturday. Eddie Lacy opened the game with a 13-yard run. From the no-huddle offense, Rodgers went to work in his first action of the preseason. He scrambled for a first down at the Packers 45-yard line and then pitched a completion to Jarrett Boykin that carried across midfield. Rodgers pitched a 9-yard completion to Randall Cobb to the Rams 33, and then Rodgers dumped the ball to Lacy for 18 yards to the Rams 15. Lacy circled left end for seven yards to the Rams eight. The Packers faced third-and-one from the Rams 6-yard line; Lacy converted. On second down, Rodgers slid to his right and found Cobb in the back of the end zone for a touchdown and a 7-0 lead following Mason Crosby’s PAT kick. Rams quarterback Sam Bradford moved his offense across midfield with a couple of pass completions. Two runs lost three yards and Bradford faced third-and-13. A short completion forced fourth-and-3 at the Packers 43. Bradford converted with 5-yard completion, Ha Ha Clinton-Dix in coverage. The Packers allowed no more yardage, swarming to the ball to force a Rams punt. The Packers took possession at their 7-yard line with 3:02 to play in the first quarter. Rodgers went right back to work, hitting Cobb for 21 yards and a first down. A quick pitch to Brandon Bostick gained nine yards, as Bostick bounced off two tacklers. Still in the no-huddle, Rodgers pitched a completion to Boykin for eight yards and a first down. Rodgers then found Andrew Quarless down the right sideline for 35 yards to the Rams 12-yard line. That play ended the quarter. 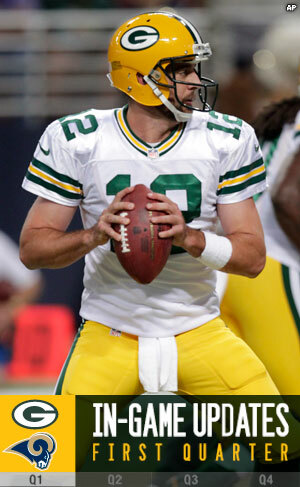 Rodgers finished the quarter having completed 10 of 12 passes for 121 yards and one touchdown.